Until 2010, USA realtor participation in this event was largely confined to Florida property. But the world has changed and, the thanks to the very attractive ROIs on offer, investment in many US states/cities has really caught the attention of UK-based investors. Examples of the companies already confirmed to present US realty at the show - and the areas they will focus on - are featured on this page (see below) with more being added as the show approaches. 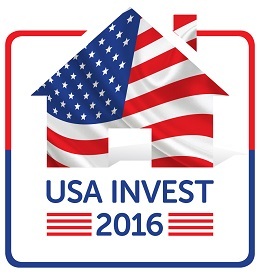 For further details on being part of `USA Invest` please contact us. Since 1954, Lennar have helped hundreds of thousands of families across America move into the next stage of their lives with a new home. Today they are one of the largest developers in the USA and build homes in some of America's the most desirable cities - properties located in communities catering to all lifestyles and include urban, suburban, active adult and golf course living. PCG Invest is a dynamic, fast growing UK based property-sourcing firm that helps its clients safely invest in the highly lucrative US buy to let residential property market. In the last twelve months, our clients invested $10m in 200 homes (average price $50,000) that achieved average NET yields of up to 20% on properties they sourced and bought using our services. We have recently introduced finance packages in most of our US cities with loans of between 60% and 75% available for multi-unit purchases, with and annual ROI of 34% achievable. Brennan Real Estate Group LLC is a fully licensed real estate broker and full service residential property management company. They specialize in Central Florida properties and are experts in the local market. They believe Orlando properties make an excellent long term rental investment portfolio due to the geographic diversification and solid rental histories. Typical Annual ROIs range 5.5% to 8%. For many foreigners, dreams to immigrate to the United States of America are less about a place to live, but rather the endless opportunities that come with U.S. residency. In fact, immigrants today share many of the same ambitions as America’s founding fathers. Investing through the EB-5 program continues to be the fastest way to U.S. residency. Investing through a federally designated Regional Center offers the potential EB-5 investor a most expeditious and relatively safe means for a successful EB-5 investor visa. They believe adjudication of each CMB EB-5 investment is easily understood since all CMB partnerships from the beginning until present follow the same transparent and simple structure. Full details at stand 72. Downtown Detroit is regenerating at a fast pace with exciting new projects springing up all over creating a ripple effect that is moving its way through the city. Currently investors can still buy quality brick built homes for less than 50% of build cost AND get a 20% pa rent. Big money is pouring into Detroit creating thousands of new jobs - many of them high tech which is creating a vibrant heart to this city once again. It would seem that these opportunities are unlikely to last, making now the time to buy in our opinion. Discuss the options with Edenbridge st stand 256. With offices in both Chicago & London, Colonial Capital’s key product is the U.S. 3 Year Social Housing Bond. The Bond was established to take advantage of the dislocation in the U.S. housing market and to provide both private and institutional investors from across the globe with above average asset-backed returns while improving the lives of people living in the poorer areas of Chicago. In addition to providing a positive social benefit, these bonds provide excellent returns of 12% p.a to investors in them. Colonial Capital currently hold a property portfolio of over $35m - which is rapidly growing. Company owner Mark Alexander has nearly 30 years of real estate, development and management experience in both the Florida market. Most recently, Mark has been advising investors on the tremendous opportunities for both long and short term investment in Florida, specialising in the Disney area, repossessions, residential development, buy-to-let and vacation homes. Full after sales service awards winning property management, individual professional and personalised service assured from one of Florida’s top real estate agents.